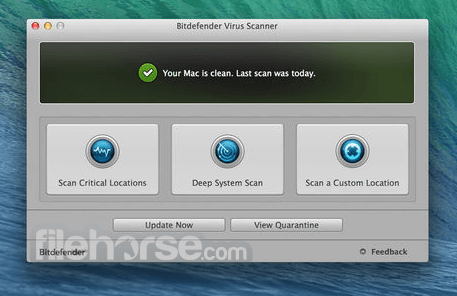 The award-winning Bitdefender engines will find that malware. For free! 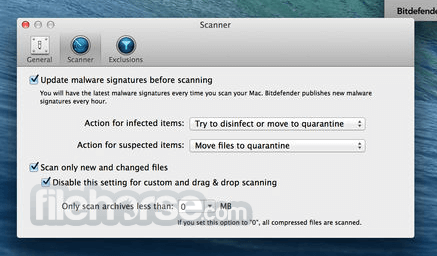 Bitdefender Virus Scanner for Mac finds Mac malware as well as Windows viruses with ease. Scan running apps, scan critical locations, scan a specific location or scan the entire system, the award-winning Bitdefender engines will find that malware. For free! Don't put your friends and family at risk by unknowingly passing malware along. Finds Mac malware as well as Windows viruses and other threats etc. Searches for malware even in archives, various other file types. i.e. pdf, pkg, zip, rar etc. Note: Not all features are available in the demo version. Requires 64-bit processor.